CAMP LUKBAN, Catbalogan Samar – The use of different kinds of mines has already been denounced by the international organizations for it causes physical and emotional scars. Here in the Philippines, the terrorist New People’s Army (NPA) persistently employs various types of mines to inflict heavy casualty to their targets. In the recent treacherous attack staged by the NPA in the outskirts of Brgy Perez, Las Navas in the province of Northern Samar that claimed ten (10) lives of soldiers, one (1) 9-year old minor and wounding of two (2) others, devastating landmines were planted and exploded. With the update of the investigation done by the scene of the crime operatives (SOCO) from Northern Samar Provincial Police Office (NSPPO), it revealed that six (6) landmines were used by the enemy but outnumbered troops ferociously fought it out up to the last. The grieving mother of the slain 9-year old boy also claimed that his son has shrapnel wounds on his head that she believed to be the cause of its immediate death. It can be recalled that improvised explosive devices (IED) were also used during an incident that occurred last August 21 in Barangay Imelda, Cataman of the same province where eight (8) dead police officers were also brutally killed. General Mario Chan, the commander of the Army’s 8th Infantry Division said that these incidents are no longer ordinary engagement between the opposing forces. It is already a demonic and extreme slaughtering of lives that are deemed condemnable. The use of landmines in any form has already been condemned and banned by the international union. In fact, two international treaties or protocols that deal specifically with landmines were passed just to totally eradicate landmines. The “1997 Ottawa Treaty” and the “1996 Amended Protocol II”. These are the main international legal instruments on landmines. Here in the Philippines, the House Bill No. 1054 and the Senate Bill No. 1595 other wise known as the “Philippine Landmines Bill” seeks to implement the two main international legal instruments on landmines that have been passed. This calls for the ultimate ban for landmines. “The CPP-NPA-NDF is the supreme violator of our people’s rights. First is the overwhelming disrespect and mockery to the Comprehensive Agreement of the Respect for Human Rights and International Humanitarian Law (CARHRIHL) and now on the disobedience of the Philippine Landmines Bill just for the sake of their ambitions and in the pursuance of their alleged revolutionary struggle,” says General Chan. “I am wondering why they persist on doing such brand of staging their atrocities. Even civilians that supposed to have nothing to do with arm struggles were victimized. It even calls me to think deeper why these terrorist is happy to see the people threatened and even getting worse with their own means of sculpting their bloody desire? Only they can answer because even people couldn’t perceive it,” the good general adds. The 8ID remains firm to their desire to end insurgency in the region despite of the incident. While they uphold the directives of the higher headquarters to suspend military operations during Yuletide seasons, 8ID assures the public to have their peaceful and threatless celebration of Christmas even it means lives in their part. CAMP LUKBAN, Catbalogan, Samar – The recent pronouncement of the National Democratic Front’s (NDF) demand for peace talk is a mere ploy to advance their offensives against the government. With the newest atrocity perpetrated by the terrorist New People’s Army (NPA) in Eastern Visayas, it shows that CPP-NPA-NDF upsurges their expert uses of lies and propaganda to steal glory against the people and the state. In Leyte province, troops of the Army’s 19th Infantry Battalion on board two (2) vehicles on their way to their camp to adhere to the suspension of military operations (SOMO) were fired upon by the undetermined number of communist terrorist somewhere in Brgy Candigahob, Carigara town, around 9 p.m. last night. Fortunately, no one was reported hurt in the incident. In Northern Samar, around 3 p.m. yesterday in the boundary of Brgys Sta. Fe and Perez all of Las Navas town, undetermined number of rebels waylaid the withdrawing troops who are supposed to “back to barracks” to observe the government’s declaration of SOMO for the Yuletide seasons and to give-way the desire of the NDF for peace-talk. The rebels used destructive improvised mines to assure of the fatality of the troops. Two (2) soldiers were reported wounded and ten (10) others were killed. One innocent minor Joven Cabe was also reported murdered who was just swimming in the river banks. The 8th Infantry Division’s leadership was dismayed with how the rebels take advantage with the command’s abidance of the peace mechanisms being orchestrated in the higher level. It only shows their true intention why peace talk is once again brought out of the picture. Major General Mario Chan, 8ID’s chief condemns in the strongest possible terms the insincerity of the CPP-NPA-NDF in their demand to engage in peace talk. He also condemns the persistent violation of the terrorist NPA on human rights and international humanitarian law. “Comprehensive Agreement on Respect for Human Rights and International Humanitarian Law (CARHRIHL) which is both signed by the NDF and our government is totally abused and disrespected. Serious violation of our people’s rights is deemed condemnable in the strongest possible terms,” declares Major General Chan. It can also be recalled just recently in Las Navas, a pumped boat load of troops with civilians who will attend the Brgy Peace and Order Council (BPOC) of Poponton was mercilessly attacked by these terrorists that resulted to the killing of two (2) civilians including one minor Edwin Gudcad and wounding two (2) others. These were already condemned by the people both locally and internationally. “I keep on challenging the different human rights advocates who keep on roaring over the violation of people’s rights to condemn this upsurge of human rights violation. Now that they are vulgarly exposed their true colors, my question remain still. Why don’t you bark once more and condemn these brutal godless monsters that mercilessly attacked the defenseless people? Prove now that you are really for the human rights of the people, and not for the rights of these terrorists,” says General Chan. Major General Chan also said that the Army units in the area will remain committed in their mandate to continuously uphold the Constitutional thrusts despite insincerity of the other party. The 8ID thru their field units is now conducting constant coordination with the PNP to run after the perpetrators and let them face the charges bounded by the law. “This incident would not make our desire to stop insurgency in the province for the benefit of our people, instead we will continue to pursue these terrorists until finally put an end on their violence,” Chan adds. “We salute the heroism paid for by our troops who rendered the supreme sacrifice of offering their lives for the true spirit of service, peace and democracy. We bestowed upon them the highest regards that the Armed Forces as well as the people can be best confer. Although it is always sad in our part, our deepest condolences to the love ones left by our comrades-in-arms”, vows General Chan. CAMP LUKBAN, Catbalogan Samar – A lunatic band of about 30 terrorist New People’s Army (NPA) murdered ten (10) soldiers and a 9 year old child and wounded two (2) soldiers at the outskirts of Brgy Sta Fe, Las Navas, Northern Samar, around 3pm, December 14. Col. Oscar Lopez, CO, 803BDE, 8ID, PA (second from right), inspects the site where the troops were landmined and ambushed by the NPAs as they pulled-out to observe the SOMO declared by the government. 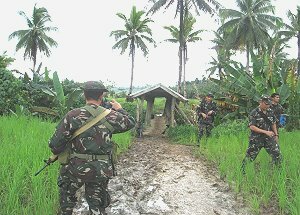 Colonel Oscar Lopez, the commanding officer of the Army’s 803rd Infantry Brigade based in Catarman, Northern Samar disclosed that the troops of 63rd Infantry Battalion were on their way back to patrol base in observance of ceasefire and peace talk with the CPP-NPA-NDF when communist terrorists encountered the troops. Two (2) soldiers were severely wounded whose rifles were damaged in a 30-minute engagement and played dead when NPA searched and looted the dead bodies of their personal belongings. Similar incident occurred last August 21 in Barangay Imelda, Cataman of the same province where eight (8) dead police officers were stripped off their personal belongings and recently on December 8, NPA treacherously killed two (2) civilians one of them is a 15-year old boy and wounding two (2) others while the victims are helplessly on board a motorized banca. These merciless and barbaric acts of the NPA are being done in the pursuance of their so called revolutionary agenda. Killing hopeless civilians and looting victims of their personal belongings are the trademarks of NPA who claim to uphold human rights and democracy. In Part IV, Article 2.1 of the Comprehensive Agreement on Respect for Human Rights and International Humanitarian Law (CARHRIHL) states that “civilians or those taking no active part in the hostilities” shall not be subjected for violence, particularly killing or causing injury as stipulated in Part IV, Article 3.1. It has been observed that the NPA vehemently abused and disrespected the CARHIHL and passionately violating our people’s right to live. The Philippine Army particularly the 8th Infantry Division respects the pronouncement of the National Democratic Front’s (NDF) demand for peace talk. For the sake of peace, troops marches off to barracks to observe the government’s declaration of suspension of military operations (SOMO) for the Yuletide seasons and in compliance to the directives from the higher headquarters. SOMO will further give time for our soldiers to be with their families whom they parted for a long period of time due to service as well as for the NPA to re-unite with their families while celebrating the meaningful time of Christmas and New Year. Is the leadership of the CPP-NPA still in control of their group? Are they really sincere about the peace talks? Are we talking to the right persons? Or are they just a lunatic band. These are the questions that are hanging in the minds of all peace loving people whose intention is merely peace and development in the region. QUEZON CITY – Human rights group Karapatan welcomes former House Speaker Jose de Venecia's proposal for the release of all political prisoners in the country. It also took note of the positive response from Malacanang that the executive is open to a general amnesty albeit subject to a “thorough review” of the cases. JDV’s appeal comes in the wake of the order of President Aquino to withdraw the charges filed against the Morong 43 in order to effect their release from unjust detention. Nonetheless, Clamor clarified, “Political prisoners are ‘prisoners of conscience’. They have been imprisoned for their political beliefs and for resisting against social injustice and oppression. The release of all political prisoners is the first of many steps the Aquino administration will need to take to stamp out the scourge of impunity for violations of human rights perpetrated by state security forces. In due time, those from the military and police as well as state prosecutors and judges who are complicit in perpetrating injustice and wrongdoings should be held accountable and in turn prosecuted,” Clamor clarified. There are now 374 political prisoners languishing in various camps and detention centers throughout the country according to Karapatan. Relatives and supporters of the Morong 43 trooped to the Department of Justice Monday morning to ensure the withdrawal of charges against the illegally detained health workers. “The Armed Forces of the Philippines is hellbent on demonizing the Morong 43. We have to guard against additional trumped-up charges that they may file to prevent their actual release from prison,” Clamor said. Karapatan also thanked Justice Secretary Leila de Lima for her firm stand to uphold and defend human rights. CATBALOGAN, Samar – Contrary to allegations that filing of recall petitions are still premature, the Provincial COMELEC’s Office of Samar, docketed two (2) separate petitions to recall Samar Governor Sharee Ann T. Tan and Vice-Governor Stephen James T. Tan at exactly 2:15 and 2:45 in the afternoon, respectively, last December 7, this year. The petitions were made pursuant to the provisions of Section 69 of the Local Government Code of RA No. 7160 in relation to Comelec Resolution 7505 for loss of confidence. Both main petitioners, Mr. Aurelio Aquino Bardaje, a registered voter of Precinct No. 73A in Brgy. Canlapwas, Catbalogan, Samar and Elvisa Aranzada Lopez, a registered voter 0f 0176A in Brgy. Hamorawon, Calbayog City, submitted nine (9) sets of the said petition with 7,575 pages per set. It contains the names, addresses and signatures with the respective precinct numbers of the supporting petitioners, as well. Based on a DILG Certification dated November 25, 2010, both officials did not furnish the DILG a copy of their assumptions to duty, as required. The recall petitions cited loss of confidence, occasioned by the malversation and wastage of the public funds, massive graft and corruption and governance through the dictates of their mother who has been charged with numerous cases of graft and corruption, as its primary reasons. Furthermore, Bardaje said that the gross incompetence of Gov. Sharee Ann T. Tan was best demonstrated by the recent illegal passage of the 2011 Annual Budgets which has been a subject of a Preliminary Injunction by the court. The petitioners were also backed up by Board Resolution No. 01-2010 which was jointly adopted by the League of Municipalities and the Philippine Councilor’s League, Samar Chapter, clamoring for a recall election. In so far as compliance to the percentage requirement in relation to the voting population of the province is concerned, the recall document showed 73,889 signatories as petitioners, which constitute 16.39% of the voting population of the province that totaled 450,768, based on a certification issued by the COMELEC, dated Nov. 25, 2010. Section 6 of the COMELEC Resolution provides the percentage requirement which shall only be at least 10% but not less than 45,000. Petitioners’ turn-out in the different municipalities of the 1st district are as follows: Almagro (1,995); Gandara (2,251); Matuguinao (464); Pagsanghan (1,440); San Jorge (1,382); Sta. Margarita (3,164); Sto. Niño (1,413); Tagapul-an (620) and Tarangnan (1,699). Meanwhile, in the 2nd District, Basey had 4,093; Catbalogan (8,501); Daram (3,984); Hinabangan (2,166); Jiabong (1,954); Marabut (1,738); Paranas (3,942); San Jose de Buan (590); Sta. Rita (3,113); Villareal (2,473) and Calbayog had 2,6907 petitioners. In the same manner, the requisite filing fee of Fifty Thousand (P50,000.00) was tendered at the Provincial Election Supervisor’s Office which is mandated by law to remit the said sum to the Cash Division of the COMELEC. In a recent development, it was learned that the same petitions have already been received last May 10, 2010 at 9:40AM by the Office of the Deputy Executive Director for Operations (ODEDO), Intramuros, Manila. The petitioners are hopeful that after the verification of their names, addresses, precinct numbers and signatures, an order finding the petition to be sufficient in form and substance will be issued. They are also requesting that a favorable recommendation be submitted by the ODEDO to the Commission for its concurrence and fix the date of the recall election. 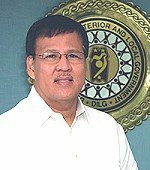 TACLOBAN CITY – Secretary Jesse M. Robredo of the Department of the Interior and Local Government (DILG) enjoined provincial governors, city and municipal mayors to refrain from using the 20% development fund of their Internal Revenue Allotment (IRA) on gifts and bonuses, even as he stressed that this should be utilized for developmental projects. Meanwhile DILG-8 Regional Director Francisco C. Jose clarified that the prohibition refers to the 20% development fund of the IRA being used for employees’ gifts and bonuses, but not to the whole IRA, which compose the bulk of many LGUs’ budgets. Likewise the 20% development fund is not to be spent for registration or participation fees in training, seminars, conferences or conventions; construction, repair or refinishing of administrative offices; purchase of administrative office furniture, fixtures, equipment or appliances; and purchase, maintenance or repair of motor vehicles or motorcycles, except for ambulances. Instead Secretary Robredo asked local authorities to allocate this part of the IRA to beneficial programs such as on livelihood and employment, school buildings, hospitals, health centers, and other projects that will improve the lives of their constituents. Section 287 of the Local Government Code of 1991 states that every local government is mandated to appropriate in its annual budget no less than 20% of its annual revenue allotment to finance worthwhile initiatives. The DILG Secretary further reminded local officials that using the 20% component of the IRA share, whether willfully or through negligence, for any purpose beyond those expressly prescribed by law or public policy shall be subject to the sanctions provided under the Local Government Code of 1991 and under such other applicable laws. QUEZON CITY – “Government stands to lose and nothing to gain.” This is the message of ANAD Partylist Rep. Jun Alcover in his privilege speech during the plenary session of the House of Representatives today, as he warned government to be cautious in dealing with the Maoist terrorists in order to stave off committing political suicide. Rep. Alcover issued this statement in the light of the Maoist terrorist’s over zealousness to restart the often-stalled peace talk with the government. “ANAD is very much concerned about these coming peace talks because in the more than 20 years past, the Maoist terrorist CPP-NPA-NDF has not shown even an iota of sincerity and commitment to reach out for peace,” Rep. Alcover explained. “In fact, Mao Ze Dung stressed that ‘Peace will only come after the revolution’ and ‘A revolution is not a dinner party or a picnic but a violent overthrow of the system’ which has been the guiding principle of the 42 years of Maoist terrorism in the country,” he explained. Reacting to a recent statement by Jose Ma. Sison, as published in nationally circulated newspapers, (pp4, Manila Bulletin, December 7) (pp.4, Manila Bulletin, December 7, 2010), “. . . If the peace talks proved to be successful. . . . If the CPP-NPA-NDF struggle becomes successful, or if a regime sympathetic to the communist cause assumes power (like that of Hugo Chaves of Venezuela)”, Rep. Alcover said, “These shows that Sison and his gang of hoodlums are not serious in talking peace with the government. There is bereft of any sincerity and commitment which they have expressed in the past,” he added. He reiterated his call on government to demand from the Maoist CPP-NPA-NDF that: a) the CPP-Central Committee issue a written appointment and authority to whoever shall head the maoist negotiating body; b) the Maoist terrorist NPA must surrender their firearms and return to the respective enclaves during the talks; c) Jose Ma. Sison must stop pretending that he is only the chief political consultant of the NDFP; and d) they must submit to the government the names of those who will be named NDF consultants to the peace talks before the start of the formal talks, for the issuance of safe conduct passes. “This is to preclude the same abuses and exploitation by the Maoist terrorist that happened during the previous peace talks covering some 20 years already. They must contribute their share of confidence building measures to show their sincerity and commitment towards achieving peace,” he stressed. “They should immediately end their pretensions and concocted stories against government and stop fanning the flames of Maoist terrorist revolution,” Alcover said. BRGY. CATICUGAN, Sta. Rita, Samar – After the gift giving activity and blood letting in Sta Rita, Samar last December 6 and 7, 2010 respectively, as part of 52nd Infantry Battalion’s celebration of Christmas, the unit continues to share the spirit of Christmas in Ormoc City last December 11, 2010. From the Battalion Headquarters at Sta. Rita, Samar, the troops of 52IB, headed by the Commanding Officer, Lt Col Roberto S. Capulong, went to Ormoc City to bring Santa Claus and his elves to the children early morning of December 11, 2010. The people in Ormoc City were very amazed to see Santa Claus riding in a military vehicle; much more, his (Santa Clause’s) elves wearing military uniform. This non-traditional military operation made not only the children in Ormoc but elders very happy as well. The soldier Santa gave assorted candies, cash and balloons to the children in the area. LtCol. Capulong said that the battalion should not wait to be the recipient for gifts this Christmas. Rather, we should be the one to give and share this Christmas. “This is just the start of our Christmas Caravan. Our goal is to bring this caravan to all provinces in Region 8”, LtCol. Capulong added. Indeed, Santa Claus is real thru our dedication of our Filipino soldiers. Not thru the NPAs or other groups against the government. In another event, the Alfa Company of the 52nd Infantry Battalion turned over some used clothing to CSWD in Ormoc City last December 11, 2010 as part of their campaign to draw the Philippine Army closer to people. Aside from being the debut activity of Christmas Caravan (Theme: Pamaskong Handog Mula sa 52IB) of the battalion, this activity is the first part of the Christmas Party of Alfa Company of 52IB, lead by 1Lt Gener Contillo. The caravan was done in the morning and another gift giving activity (Theme: Drawing your Army Closer to the People) was done in the evening. During the Christmas Party proper, Alfa Company, 52IB turned over used clothing to CSWD in Ormoc City, headed by Ms Marietta Legaspi. Alfa Company, 52IB generated more than 40 sacks or estimated 600 kgs of used clothing by coordinating with LGUs in the whole island of Leyte thru their CAFGU Detachments. This kind of military activities proves that soldiers are dedicated not only in winning the battle with the use of their guns and weapons but with the use of their hearts and with their love of the country and people. This proves that soldiers are stepping out of their traditional role to serve and protect the Filipino people.